This figure also was shown to me by the same two Navaho girls, at the St. Louis Exposition, in November, 1904. An example of the finished pattern collected by Mr. Culin at St. Michael's Mission, Arizona, and preserved in the Philadelphia Free Museum of Science and Art (No. 22721) is labelled Nashoi-dichizhi = a Lizard. At Grand Canyon, Arizona, I saw a Navaho Indian form the "Lizard"; he secured the results of the First movement, however, by simply exchanging the index loops after the "Bow" Opening. 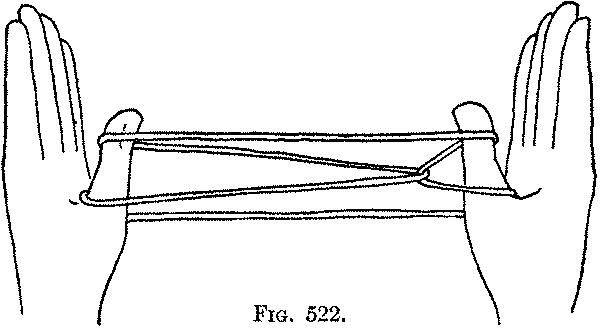 First: This movement is a slight modification of the opening movement in was "Bow." Hold the loop between the thumb and index of each hand so that a short piece of string passes from hand to hand and a long loop hangs down. 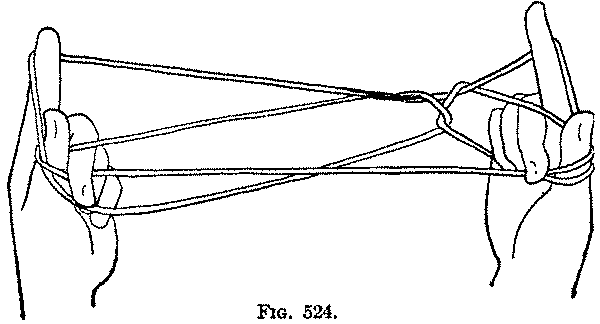 In the short piece make a small hanging ring, by bringing the hands together and putting the part of the string held by the right hand away from you over the part of the string held by the left hand; then give this ring one twist, by turning it around away from you from right to left. Put each index finger toward you and downward into the ring, and put the other three fingers toward you into the long hanging loop. Now, pressing your right thumb down on the two right hand strings passing over the right index, to keep them from slipping (Fig. 520), separate the hands. Put each thumb away from you into the loop held by the middle, ring and little fingers; withdraw these fingers; turn each index away from you and up, and turn each thumb up and toward you under the index loop, and place the hands in the usual position (Fig. 521). You now have a loop on each index and a loop on each thumb; and a loop is formed near the right hand by the left far index string and the left near thumb string passing around the string which runs from the far side of the right index to the near side of the right thumb. 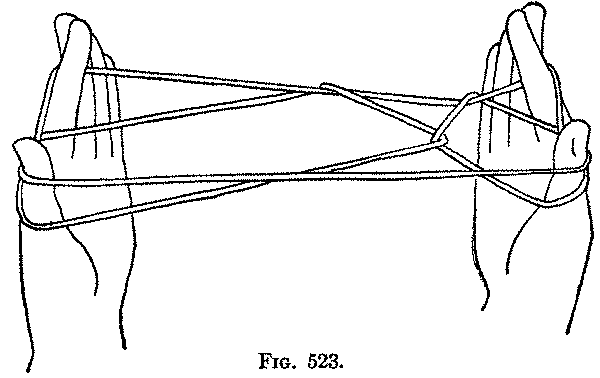 Second: Transfer the index loops to the thumbs, by passing each thumb from below into the index loop and withdrawing the index (Fig. 522). Third: Pass each index toward you over the upper far thumb string, and then, pulling that string away from you, put the index down on the far side of the lower far thumb string (the far string which passes directly from thumb to thumb), and pick up from below, on the back of the finger, this lower far thumb string, and return the index to its position; thereby drawing the string through the upper thumb loop (Fig. 523). 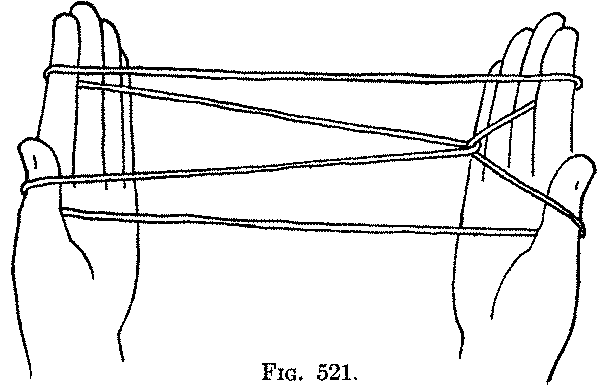 Fourth: Put the middle and ring fingers of each hand from below through the thumb loop, and catch between them the upper near thumb string (which passes directly from thumb to thumb) (Fig. 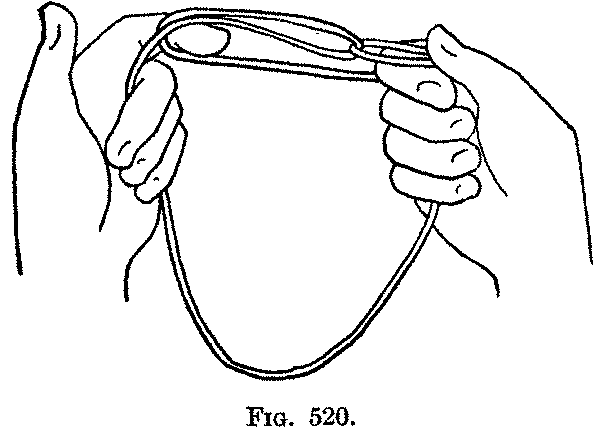 524), and pull it down through the loop with the middle finger, and hold it down by closing the finger on the palm, at the same time releasing the loops from the thumbs and drawing the strings tight (Fig. 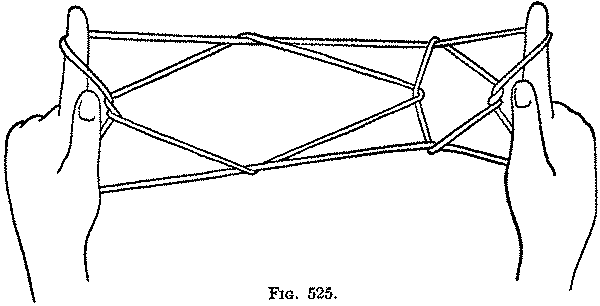 525). The figure is extended between the ends of the index fingers and the middle fingers closed on the palms. The head of the "Lizard" is at the right end of the figure. If you do not keep the head of the "Lizard" small by following carefully the First movement you will find that the finished figure differs from the preceding "Twin Stars" figure, only by having the central cross strings looped around each other.